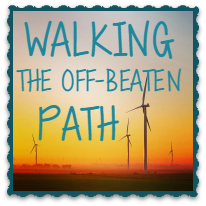 Walking the off-beaten path: Walking Dazed and Confused! "and to think that some in society think that farmers are not too bright...really"
I'm here to tell you that anyone who thinks the above statement is true needs to sit in on one of these meetings, and that person would most definitely change his/her tune! I walked in to the morning session one hour late UGH! (I thought it started at 9:00! 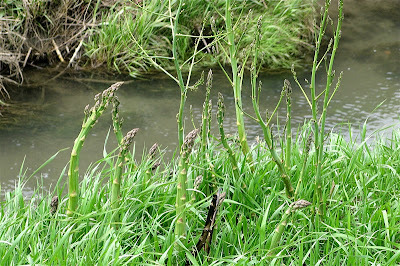 ), and I was the only girl (not a real big surprise but still very duck-out-of-waterish!). So then I realize, after listening to the conversations of the other four farmers, that I was WAY out of my comfort zone on the terminologies! MERCY! Ok Lana, Breathe! Listen! Focus! Ask Questions (but try to sound too lost). The guys were great, and the JD guys there to help us were very patient. Of course I sat at the computer that would NOT stop making a "SQUACK" every time I pushed a wrong button or did something out of order! UGH! 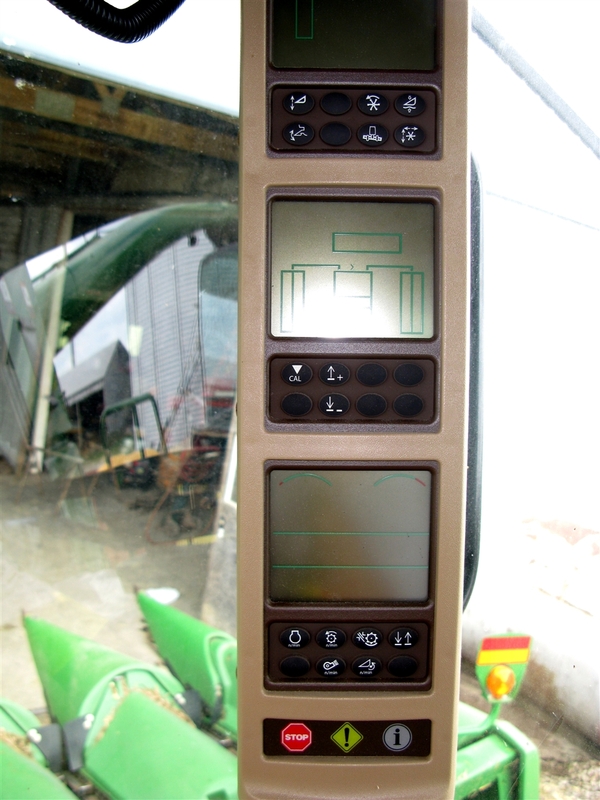 Speaking of buttons, this is what the inside of a combine looks like these days! The outside is all bright and shiny thanks to our nephew and a FEW cans of wax. This is our second year with this combine. This is the monitor that you can plug information into right from your seat. Up at the top left of this screen is where you insert the card that carries all the IMPORTANT INFORMATION! MORE MONITERS! I'm not sure what they all do.........YET! 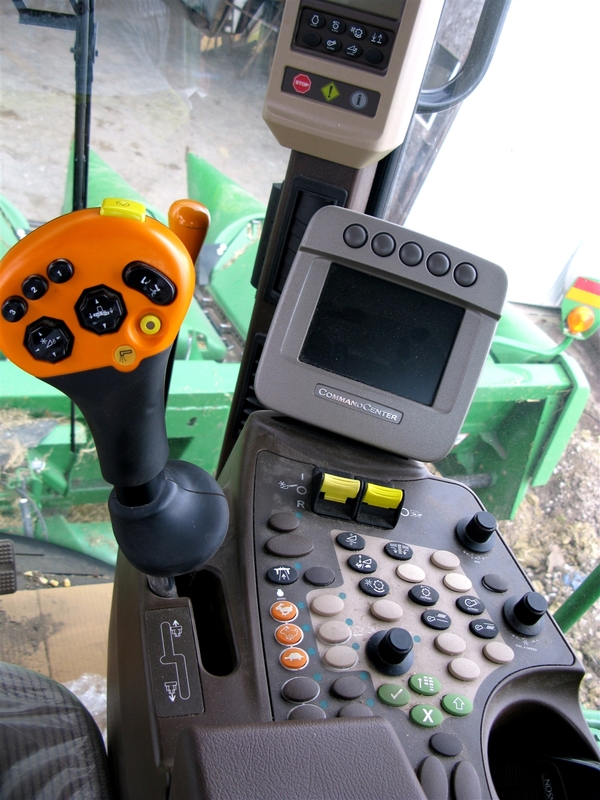 The orange/yellow control makes the combine go forward. Above is a closer look at the vertical monitors. Below are even more buttons! I think I can figure out what the bunnies and turtle buttons do, but the others and the ones NOT marked are making me worry! At the end of the first session, I decided I would come back for a repeater course in the afternoon. I tried to get Tall Guy to go with me this time, but he had a roof to fix or something. As I was leaving he was in HIS CHAIR "resting" until his dad came back out! The afternoon session was much more my speed. Everyone was within one year of using this program, so we all had similar questions and abilities. This program can generate like a bazillion different maps and reports based on the information you pulg into the data fields. 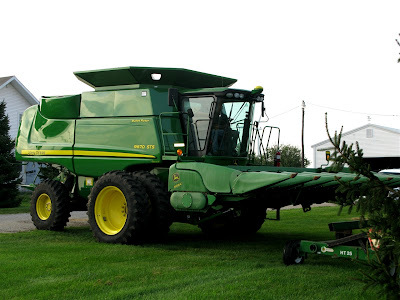 What our very dear John Deere guy kept telling me is to go home and play with it. The more you do, be it right or wrong, the more you will learn. I think he is absolutely right, but it's a bit scary to be playing with all this information and NOT mess it up! It's truly mind-boggling to imagine all that you can do! So if you have friends who think of farmers as people who worked on "Hee Haw" during their off-time, send them to my blog, and I will set them straight. You have to know more than how to cal BR549 to work the farm equipment these days. It is not for the faint of brain! Wow! Sounds very complicated to me. I can hardly remember how to make the utility tractor go forward! And moving the bucket on the bobcat is always trial and error. I have a feeling I would NOT be good in a combine like that! That's funny. 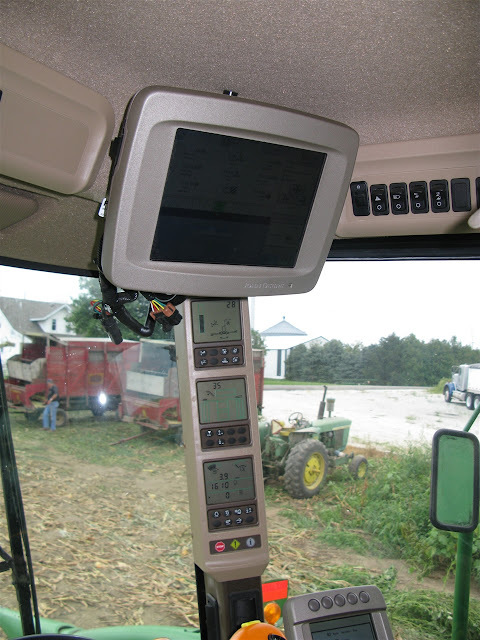 For me, mInus all the monitors...I think operating a Combine is way easier than operating a Tractor while working ground...those monitors are intimidating, though!!! And how much does one of these spiffy little sporty models cost? Hubby saw your post and wondered what all those monitors and things do. My dad and brother both work for John Deere and every winter they are sent off to "John Deere School" to stay updated on the latest technology. Very interesting from their perspective too. My brother was giving me statistics (yields, time, cost, amt of gas used, etc.) on a farmer that has auto GPS planting set on his tractor. So at the end of a row the tractor takes over and knows exactly where to start the next row. 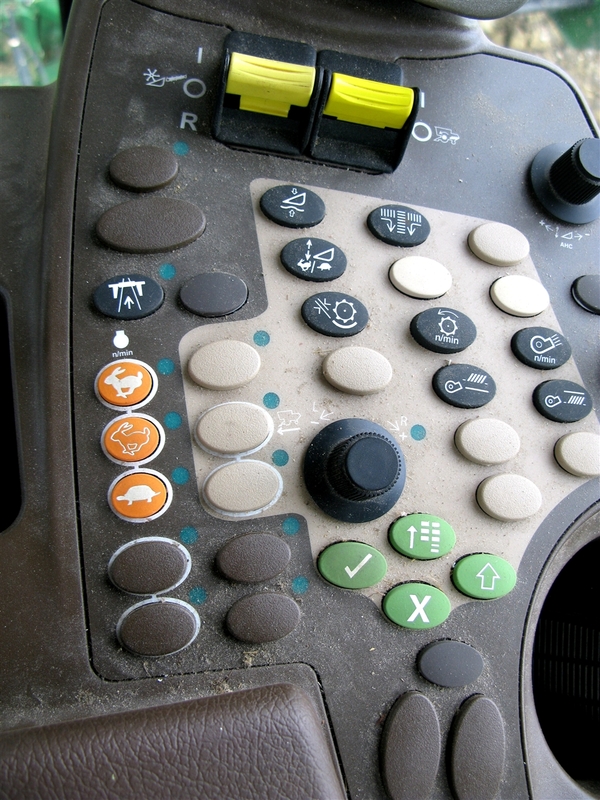 Basically all the farmer had to do was turn the tractor around...very interesting stuff. Makes you wonder how your grandkids are going to be farming someday doesn't it? Have fun --and keep us posted how you do!!! so, do all those gidgety gadgets make the corn and beans grow any better than they did way back when I lived on the farm?? lol! technology is really cool, but can be so confusing!! good luck to you to learn all that new stuff. it definately takes a lot of brain power to get it all straight! Yeah, well, unfortunately, there are still a few eggheads out there who think of farmers as 'country bumpkins.' Farmers who have more knowledge in their little fingers than many of the ivy league educated desk warmers. They need to get out of the city and look around at where their food comes from and those who are smart enough to know how to raise it and bring it to them. 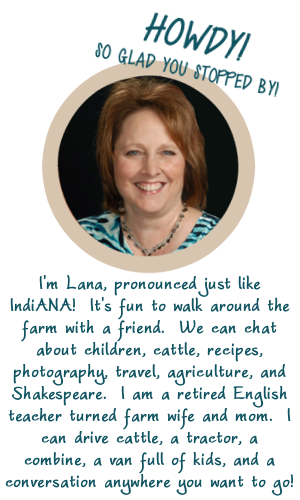 Great post, Lana! We only grow hay, so no combines on our farm. I still haven't even learned how to drive the tractor! (Although I don't think I'll make it through another summer without learning.) Good luck with your fancy computer system! WOW! Sounds like fun! I grew up in Wyoming, so that is all the rage there! LOL! 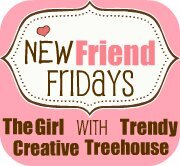 I'm visiting from Trendy Treehouse!! Have a great weekend!!! We luckily live in Utah now, I should update my profile I guess, we have family that might have to leave their homes though. I was raised 20 miles outside of Yellowstone, that is my favorite place in the world! ( I am biased though). I'm following back your follow back! Lol!! thanks! Pleased to meet you, Indiana farmergirl! Wow I am intrigued! Following you now! Please follow me back! God Bless, have a great weekend! Very intresting and informative post. Farming is really quite a technical businness these days. Man Crush Monday! I'm Married to a Rock Star! The BEST Strawberry Shortcake Ever! 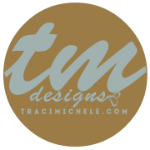 Copyright Lana Wallpe 2014 Blog Design: Traci Michele Designs. Powered by Blogger.